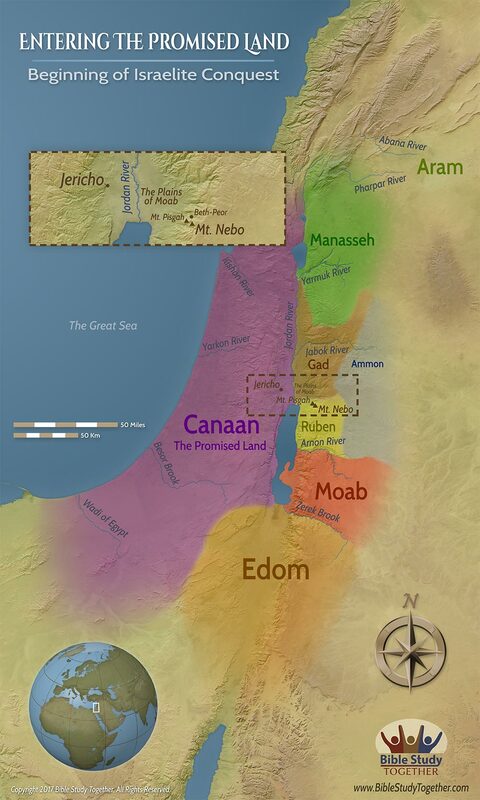 1And Moses went up from the plains of Moab unto the mountain of Nebo, to the top of Pisgah, that is over against Jericho. And the LORD showed him all the land of Gilead, unto Dan,2And all Naphtali, and the land of Ephraim, and Manasseh, and all the land of Judah, unto the utmost sea,3And the south, and the plain of the valley of Jericho, the city of palm trees, unto Zoar.4And the LORD said unto him, This is the land which I sware unto Abraham, unto Isaac, and unto Jacob, saying, I will give it unto thy seed: I have caused thee to see it with thine eyes, but thou shalt not go over thither.5So Moses the servant of the LORD died there in the land of Moab, according to the word of the LORD.6And he buried him in a valley in the land of Moab, over against Bethpeor: but no man knoweth of his sepulchre unto this day.7And Moses was an hundred and twenty years old when he died: his eye was not dim, nor his natural force abated.8And the children of Israel wept for Moses in the plains of Moab thirty days: so the days of weeping and mourning for Moses were ended.9And Joshua the son of Nun was full of the spirit of wisdom; for Moses had laid his hands upon him: and the children of Israel hearkened unto him, and did as the LORD commanded Moses.10And there arose not a prophet since in Israel like unto Moses, whom the LORD knew face to face,11In all the signs and the wonders, which the LORD sent him to do in the land of Egypt to Pharaoh, and to all his servants, and to all his land,12And in all that mighty hand, and in all the great terror which Moses showed in the sight of all Israel. 1Now after the death of Moses the servant of the LORD it came to pass, that the LORD spake unto Joshua the son of Nun, Moses' minister, saying,2Moses my servant is dead; now therefore arise, go over this Jordan, thou, and all this people, unto the land which I do give to them, even to the children of Israel.3Every place that the sole of your foot shall tread upon, that have I given unto you, as I said unto Moses.4From the wilderness and this Lebanon even unto the great river, the river Euphrates, all the land of the Hittites, and unto the great sea toward the going down of the sun, shall be your coast.5There shall not any man be able to stand before thee all the days of thy life: as I was with Moses, so I will be with thee: I will not fail thee, nor forsake thee.6Be strong and of a good courage: for unto this people shalt thou divide for an inheritance the land, which I sware unto their fathers to give them.7Only be thou strong and very courageous, that thou mayest observe to do according to all the law, which Moses my servant commanded thee: turn not from it to the right hand or to the left, that thou mayest prosper whithersoever thou goest.8This book of the law shall not depart out of thy mouth; but thou shalt meditate therein day and night, that thou mayest observe to do according to all that is written therein: for then thou shalt make thy way prosperous, and then thou shalt have good success.9Have not I commanded thee? Be strong and of a good courage; be not afraid, neither be thou dismayed: for the LORD thy God is with thee whithersoever thou goest.10Then Joshua commanded the officers of the people, saying,11Pass through the host, and command the people, saying, Prepare you victuals; for within three days ye shall pass over this Jordan, to go in to possess the land, which the LORD your God giveth you to possess it.12And to the Reubenites, and to the Gadites, and to half the tribe of Manasseh, spake Joshua, saying,13Remember the word which Moses the servant of the LORD commanded you, saying, The LORD your God hath given you rest, and hath given you this land.14Your wives, your little ones, and your cattle, shall remain in the land which Moses gave you on this side Jordan; but ye shall pass before your brethren armed, all the mighty men of valour, and help them;15Until the LORD have given your brethren rest, as he hath given you, and they also have possessed the land which the LORD your God giveth them: then ye shall return unto the land of your possession, and enjoy it, which Moses the LORD'S servant gave you on this side Jordan toward the sunrising.16And they answered Joshua, saying, All that thou commandest us we will do, and whithersoever thou sendest us, we will go.17According as we hearkened unto Moses in all things, so will we hearken unto thee: only the LORD thy God be with thee, as he was with Moses.18Whosoever he be that doth rebel against thy commandment, and will not hearken unto thy words in all that thou commandest him, he shall be put to death: only be strong and of a good courage. 13When Jesus came into the coasts of Caesarea Philippi, he asked his disciples, saying, Whom do men say that I the Son of man am?14And they said, Some say that thou art John the Baptist: some, Elias; and others, Jeremias, or one of the prophets.15He saith unto them, But whom say ye that I am?16And Simon Peter answered and said, Thou art the Christ, the Son of the living God.17And Jesus answered and said unto him, Blessed art thou, Simon Barjona: for flesh and blood hath not revealed it unto thee, but my Father which is in heaven.18And I say also unto thee, That thou art Peter, and upon this rock I will build my church; and the gates of hell shall not prevail against it.19And I will give unto thee the keys of the kingdom of heaven: and whatsoever thou shalt bind on earth shall be bound in heaven: and whatsoever thou shalt loose on earth shall be loosed in heaven.20Then charged he his disciples that they should tell no man that he was Jesus the Christ. 18And it came to pass, as he was alone praying, his disciples were with him: and he asked them, saying, Whom say the people that I am?19They answering said, John the Baptist; but some say, Elias; and others say, that one of the old prophets is risen again.20He said unto them, But whom say ye that I am? Peter answering said, The Christ of God. What did God require of Joshua to receive the blessing that Moses missed? What reason do you have to be strong and courageous? How was Jesus a prophet that people could confuse with Moses? What is significant about Peter’s proclamation? Ask someone who they think Jesus is.